Incident Details: A 59 year old male, walking with family just above Gutherscale. suddenly had a fit, and collapsed. The Team responded swiftly, with one Landrover full of personnel leaving within 8 minutes of the alert. A land ambulance and Helimed 58 were also scrambled, whilst three other Team members went direct to the scene. In addition, a medic from Teesdale team offered her assistance as she was in the area. The gentleman had recovered somewhat by the time the emergency services arrived, and he was assessed by the medical personnel. 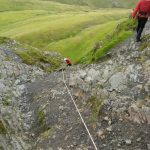 The Team then stretchered from the fell to the road ambulance, and he was taken to the Keswick Cottage Hospital for a further check up. 12 Team members + 1 Teesdale – 1 hour 22 minutes.